This talk examines the politics of time as they play out through various problems of the queue—the organizational science and logistics of waiting lines. Drawing on ethnographic analysis of civility campaigns and customs inspection reform in contemporary China, I will show how the queue offers insight into shared concerns about “quality control” over the flows of both global supply chains and the movement of populations. These concerns link the market metrics of timeliness as configured by the dominant global production model of JIT or Just-in-Time with social questions of expedience and justice in the other sense of being "just" in time. These entangled issues converge in what I will explain as a politics of tempo--that is, as a question of pace and rhythm--in contradistinction to the conventional emphasis on "speed" or "space-time compression" in the analysis of global temporalities. Biosketch: Julie Y. Chu is a sociocultural anthropologist with interests in mobility and migration, economy and value, ritual life, material culture, media and technology, and state regulatory regimes. 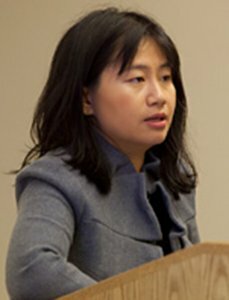 Her book, Cosmologies of Credit: Transnational Mobility and the Politics of Destination in China (Duke University Press, 2010), received the 2011 Sharon Stephens Prize from the American Ethnological Society and the 2012 Clifford Geertz Prize from the Society for the Anthropology of Religion. Her current writing project is entitled The Hinge of Time: Infrastructure and Chronopolitics at China's Global Edge. Based on three years of fieldwork largely among Chinese customs inspectors and transnational migrant couriers, this work will analyze various infrastructures in place (legal-rational, financial, cosmic, piratical) for managing the temporal intensities and rhythms of people and things on the move between Southern China and the United States. A graduate of NYU’s Program in Culture and Media, she is also currently completing video projects related to her fieldwork as well as developing a new ethnographic focus on Chinese soundscapes, especially in relation to the changing qualities and valuations of the Chinese concept of renao (热闹, a bustling scene, social liveliness or, literally, “heat and noise”).